With one crazy hectic week ending, and a brand new week beginning, I'm now finally catching my breath and preparing for the awaiting week. Between moving, and buying furniture, and cleaning, and decorating, and assimilating the pets to their new environment, my weekend has not been a walk in the park. And now, I have to do laundry, figure out what I'm going to wear to work tomorrow, walk the dog, feed her and the cat, and prep my lunchbox for tomorrow. I'm tired, with my feet hurting a bit, as well as my back, and all I can think of is what would be easy to whip up and eat within the next 30 minutes that doesn't require a lot of work?! Well, why not an easy salad? The featured salad today has a bit of everything that satisfies me and I hope will satisfy you: cheese, potatoes, and Ranch sauce. The only part that makes this salad go from a 2 minute setup to a 30 minute setup is the fact that you have to roast the potatoes and carrots for just about 25 minutes. 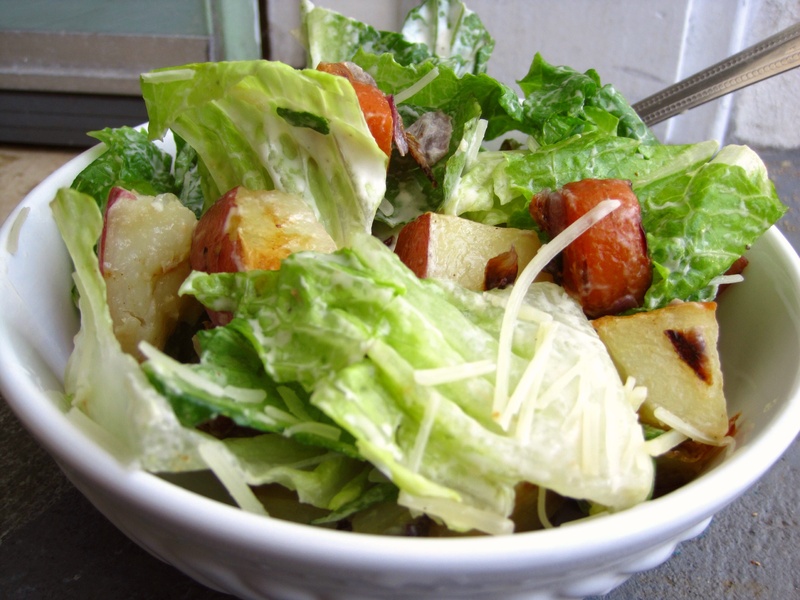 Once it's all mixed together, the heartiness of the salad will fill you up without any unwanted fatty calories. I think it would even go well mixed with a few toasted nuts to give the salad a little more dimension or flavor depth. Or, maybe another cheese could be added instead of the Parmesan. Feel free to have fun with it. Now, let me just excuse myself for a bit while I munch on my salad and watch a bit of TV! 1) Heat oven to 425F. 2) Toss the vegetables with the oil in a 15x10x1" pan. 3) Bake the vegetables 25 minutes or until tender but crisp, stirring after 15 minutes. Let cool for 5 minutes. 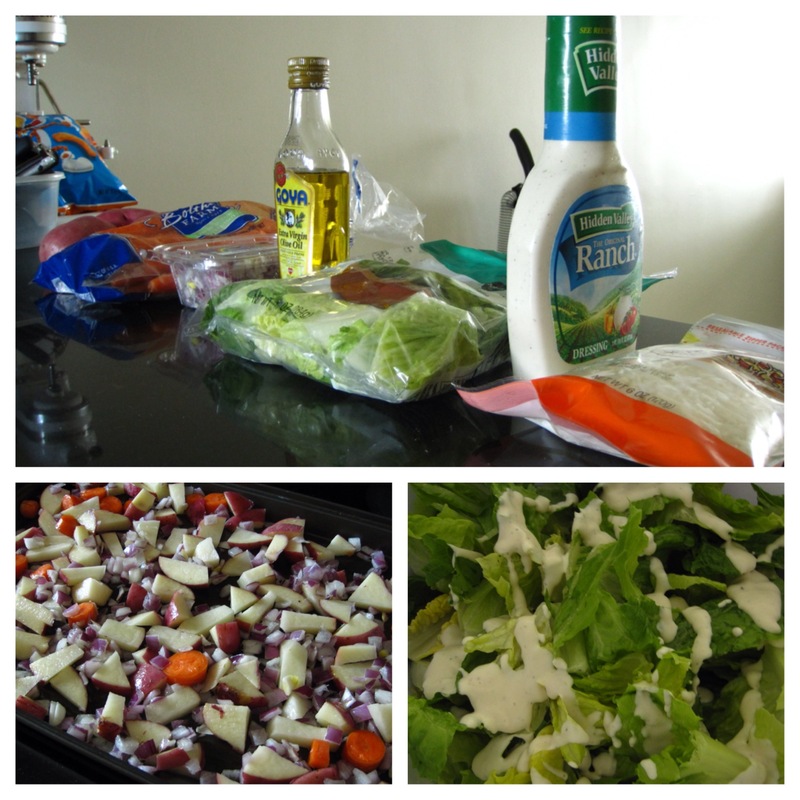 4) Mix the lettuce with the dressing; add the vegetables. Serve onto 4 plates. Top each serving with the cheese.